Tea called " the king drink in the east " is one of the famous kinds of drink in the world.After analysing, the chinese green tea contains about 400 elements such as the caffeine, tea polyphenol, protein, carbohydrate and so on. Modern research find that often drinking tea can make people refreshed and eliminate the axunge.What's more, often drinking longjing tea can lower blood pressure.So there are many benefits of drinking chinese green tea. Next time I will tell you what is forbidden when you drink tea. A study was recently released, done in Japan, that showed that elderly people who drank 4 or more cups of green tea a day were considerably less likely to become physically disabled due to age. The study was very careful to isolate causal and correlative factors. I started drinking green tea the day I read that article. Yeah,tea is a very popular drinking among the middle-aged in China.But I think the young should drink tea instead of coffee.Because the they have the same functions,more important is drinking tea has less side effect. I came to drinking green tea from the other angle. I drink a fair amount of tea and when I was drinking black tea, tea was my only use for milk. Eventually after throwing away countless half used bottles of milk I started to use dried milk but that didn't really do it for me plus I still didn't use a massive amount with the result that I was throwing away lots of dried milk. The obvious next step was to drink my tea without milk (I'd stopped taking sugar in my tea whilst still a child). Black tea without milk is not very refreshing, in fact not refreshing at all! The next step was to try different teas, fruit and herb teas didn't do it for me - I eventually ended up on green tea, occasionally when I'm flush, white tea. It was only after I started to drink it that I learnt about the health benefits. I have absolutely no evidence to back this up but I believe my recovery from a stroke was down in some little bit to my drinking green tea. That's amazing that it may have helped your recovery. I was drinking more tea than coffee as well, but I love all teas. I just couldn't get into the green at first becuase I couldn't make it past that grassy flavour. I still have to take honey in my green tea but honey's really good for you too. Does it make a difference when it is mixed? I mix my regular Lipton orange and black pekoe with green tea, tea bag for tea bag and it doesn't really taste any different to me. Hoping that I get the same health benefits. From all I read, green tea is amazing. That's really clever. I'm going to give that a shot. I've been brewing green tea and putting it in fruit smoothies. I don't see why you wouldn't get the benefits. Could I have a Long Island Iced Tea, please? Sorry, I only have the Chinese tea.If you like Chinese tea,you can come to my website to buy it. I think tea also has a great detox element! I'm a tea fan all the way esp. mixed with lemon juice. The tea mixed with lemon juice must be tasty. I love tea and aside from water it is the best drink for your health. I drink green tea in the morning and herbal tea at night. I use honey or agave nectar to sweeten my tea and it tastes great. Enjoy! 2. Lowers LDL levels - Researchers validate that green tea’s has the power to lower bad cholesterol. 3. 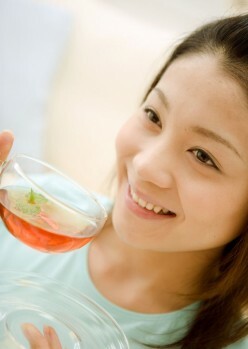 Prevents Tooth Decay - Researchers suggests, a cup of green tea can lower the risk of tooth decay. 4. Burns Calories - Medical research suggests green tea can prevent obesity because of their cholesterol-lowering abilities. Let's get to know each other: Do You Prefer Coffee or Tea? Do you prefer coffee or tea?I'm a tea drinker. Black, white, green...I like them all. I never liked the taste of coffee, but I do like the smell.